As you may know, dear readers, we’ve shared accessibility tips before — on topics like alt text and labeling, designing for keyboard navigation, and accessibility plug-ins. This week, we’d like to draw your attention (get it?) to color contrast. Color contrast is the difference in color between elements on a page. Things with low contrast (for example, dark blue text on a black background) can be hard to see. Using text with high contrast (like black text on a white background) makes your content easier for everyone to read — and it’s especially important for people with low vision. Not sure if your color contrast is kosher? Try out this nifty Firefox plug-in. Working from an existing palette? Use this color palette builder to find 508-compliant color pairs. Got a base color? Use COLOR SAFE to find high-contrast matches. Starting from scratch? Check out these color-safe combinations. 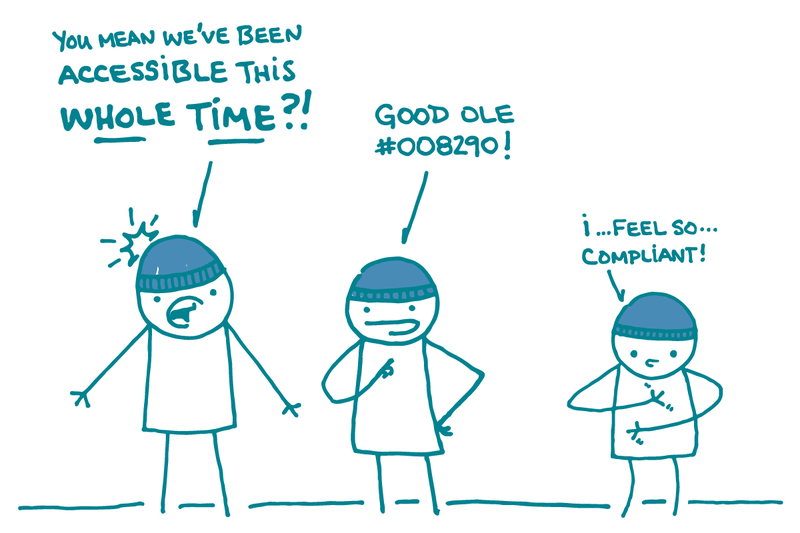 The bottom line: On Blue Beanie Day (and every day! ), a quick color check goes a long way toward making health information as accessible as it can be.